You're not the first person to say that James was their favorite vampire. Personally, I don't see the attraction, since I'm a huge Edward fan. I can't wait for the 2nd movie! I agree with Scrappin mom...I would love to watch this guy... Yummy!!! 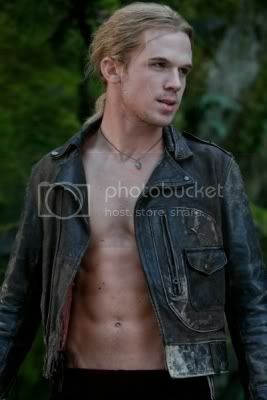 Well, I'm not a Twilight fan *ducking* :), however, he is quite yummy! Sorry about your tooth- you deserve to whine about it, ouch! Hope you feel better soon! Whine away, you deserve it!! WHAT?!?!?!?! I don't know if we can be friends now...LOL! Edward is my heart throb! I love him way too much for someone who is fictional, I will tell you that! I am a MAJOR Twilight nut. Check out the trailers online for New Moon, it looks great! This is the most addicting story ever, is it not? Now, watch it again, I think you may have totally missed the whole Edward thing...LOL!